The U.S. Federal Communications Commission has launched a Web page that tracks how major U.S. mobile carriers are alerting their customers who risk exceeding monthly usage limits for voice calls, data, SMS, and international roaming. The page is part of an agreement reached between the FCC and the CTIA wireless trade association in October to help users avoid high-priced overage charges on their monthly bills. Under the voluntary agreement, ten carriers say they will give customers alerts in two of the four categories by October 2012 and support all four types of warning by April 2013. Carriers taking part in the agreement include the big four -- AT&T, Sprint, T-Mobile, and Verizon -- as well as Cellcom, Cellular One of Northeast Arizona, Clearwire, Illinois Valley Cellular, SouthernLINC Wireless, and U.S. Cellular. The participating carriers represent 97 percent of the U.S. mobile subscriber base, according to the FCC. Users will get two types of automatic warnings under the new system: one when you are about to reach your monthly usage limit, and another if you exceed your monthly allowance. It's intended to help users avoid high-priced overage charges imposed after sending that extra text message or streaming yet another baseball game over a carrier's data network. Whether users receive their alerts as text messages, e-mail, or voice calls appears to be at the discretion of each individual carrier. All alerts must be automatic and provided free of charge. The FCC's Web page listing all the carriers' procedures will be updated monthly to show how each carrier lives up to its commitment. Alert categories with an "N/A" indicate that the carrier does not have a usage limit for a particular service. 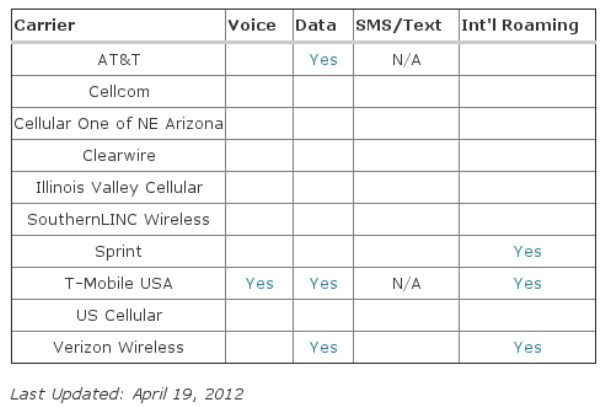 The table on the FCC's Webpage includes links to "relevant details" on each carrier's site for the four service types. according to the FCC's most recently published table. AT&T and Sprint, at least among the four major carriers, are the most delinquent, by providing only one alert each. But that is still better than what customers are getting from the six participating regional carriers, none of which yet alert users who risk hitting their usage limits and incurring overage charges. The FCC says 30 million Americans (one in six mobile subscribers) have experienced a sudden upswing in mobile charges thanks to "misunderstood advertising, unanticipated roaming or data charges, and other problems." The Web is filled with stories from sufferers of mobile bill shock such as the 66-year-old retiree who received an $18,000 bill in 2010 after his family's data usage plan expired. That same year, the FCC received a complaint from another mobile subscriber who wound up with a whopping $68,505 bill. The fight over mobile bill shock has been ongoing since May 2010 when the FCC issued a request for public comment on unexpected high-priced monthly cell phone bills. By the fall, the FCC had a set of proposed rules for alerting customers to bill shock, culminating in the October 2011 agreement between the federal agency and the CTIA. But just because customers will get a heads up on pending overage charges, don't count on surprise mobile charges to disappear entirely. Carriers have a long history of surprising users with unanticipated costs such as activation, upgrade, and early cancellation fees. Most recently, Verizon sparked a mini-controversy after the carrier announced in December it would charge a $2 convenience fee to process one-time credit and debit card bill payments made by phone and online. The carrier dropped the scheme less than 24 hours later following public outrage.